Let’s be honest: a holiday in Bali quickly turns into the biggest intake of food you might have ever experienced during a holiday. From LA and Milan to Australia and Indonesia – Bali’s café owners bring the best of the best from their countries to this island paradise, resulting in a coffee and food scene the rest of the world can only dream of. We make sure you don’t get lost when doing your holiday research and present you the 30 Best Cafes in Bali. 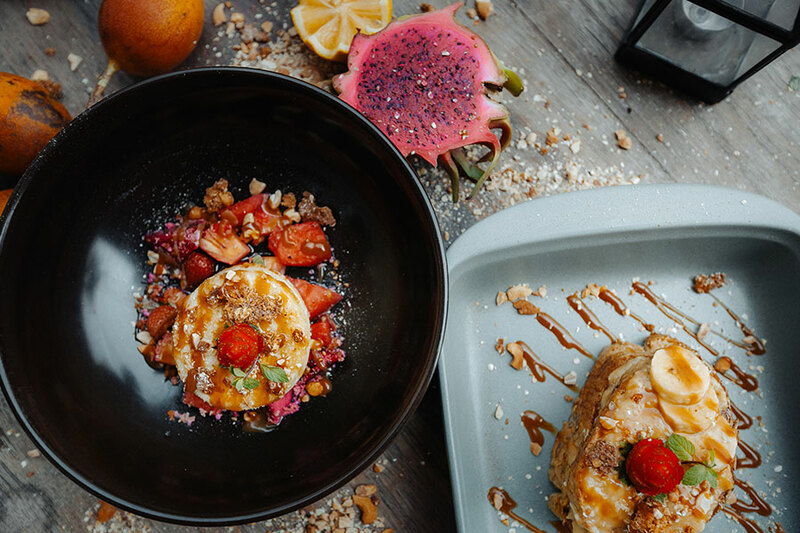 One of Bali’s most iconic eateries, Café Organic offers health-conscious vegetarian and vegan meals passionately crafted using fresh, locally farmed produce. Every corner has already been snapped for the gram with the star of the show being the Acai bowls served in coconuts! 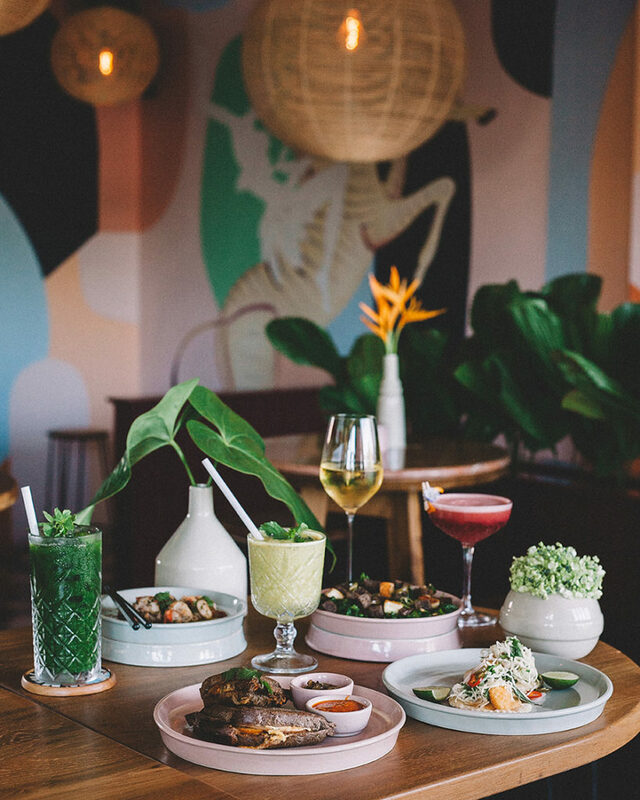 At their Petitenget location in the buzzing heart of Seminyak, you’ll find marble table tops, living green walls, and the oh so famous #GardenGangstas mural. Their latest endeavour in Umalas is a wide open space set in Bali’s rice terraces and veggie gardens. Whichever location is your favourite, Cafe Organic is definitely one of the best Bali cafes. Click here to browse Cafe Organic’s whole menu. Coffee Cartel is everything you need in the perfect cafe: delicious food, specialty coffee, GF/Vegan options, Instagram-able features, fast wifi, and spacious seating areas. 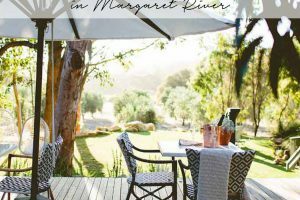 Take your pick of sitting at their large wooden table indoors, beautiful marble tables outdoors or upstairs on their al-fresco terrace and settle in to enjoy their vast menu of mouth-watering dishes. 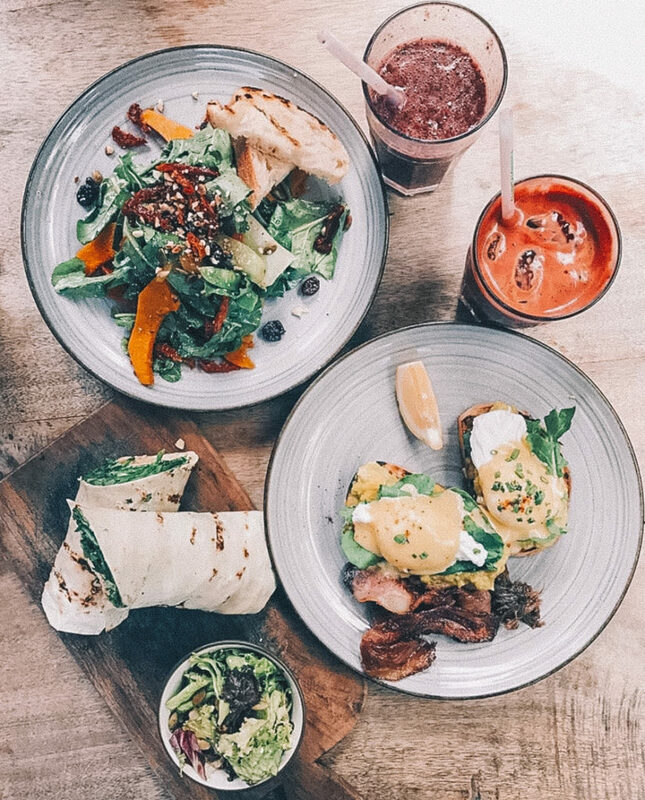 Some of our favourites include the Nasi Goreng made with cauliflower rice, Big Banana Boss protein shake (made with peanut butter & coconut milk), and the Columbian brekky wrap. 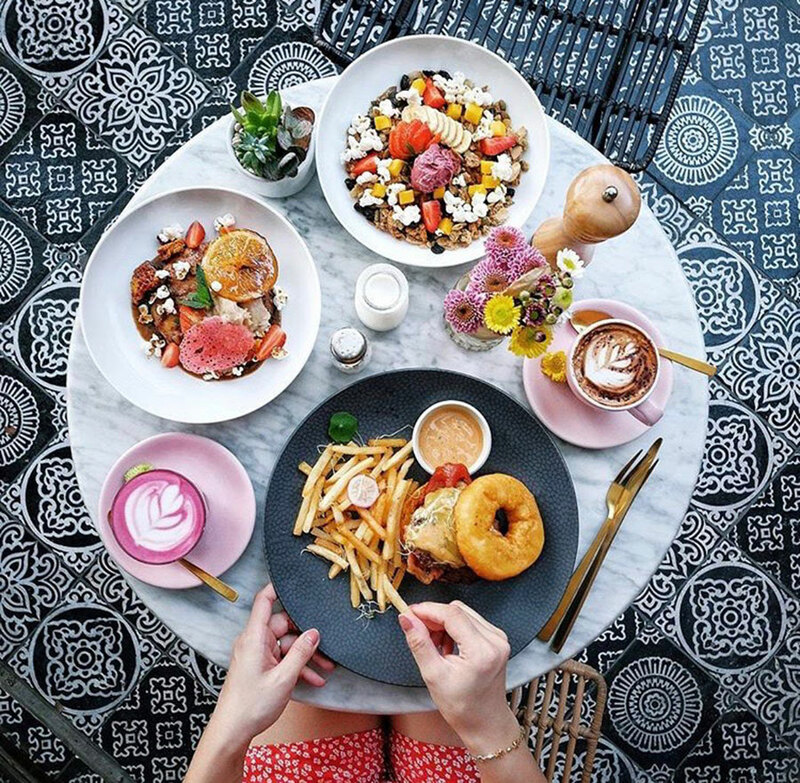 Open for breakfast, lunch, and afternoon treats, this boutique cafe should be at the top of your Bali cafe destination list! Click here to browse Coffee Cartel Seminyak’s menu. TAC Tip: Enjoy 20% off the bill at Coffee Cartel with our Hungry in Bali dining guide. You cannot go past this Seminyak institution with its brightly colored, captivating unique quirky interiors and mouthwatering, day-to-night food offerings. The restaurant, cocktail bar & coffee den will give you a hard time choosing your menu favourites – as they simply have one of the tastiest selection in town for breakfast, lunch and dinner. Click here to browse Sea Circus Bali’s menu. TAC Tip: Enjoy 20% off the bill or unlimited 2-for-1 cocktails at Sea Circus with your copy of Hungry in Bali. 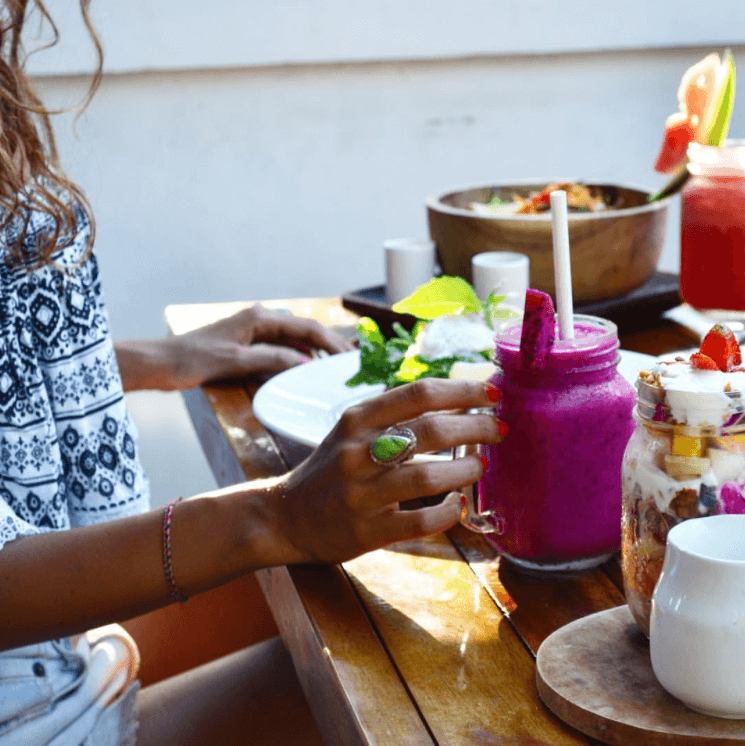 The breezy rooftop cafe stands as one of Seminyak’s most popular hangouts for great food, delicious coffee, power-packed healthy smoothies and fresh juices all wrapped up in a relaxing atmosphere. A must-visit in Seminyak when you’re looking for the ultimate healthy yet satisfying meal! Click here to browse Shelter Seminyak’s whole menu. 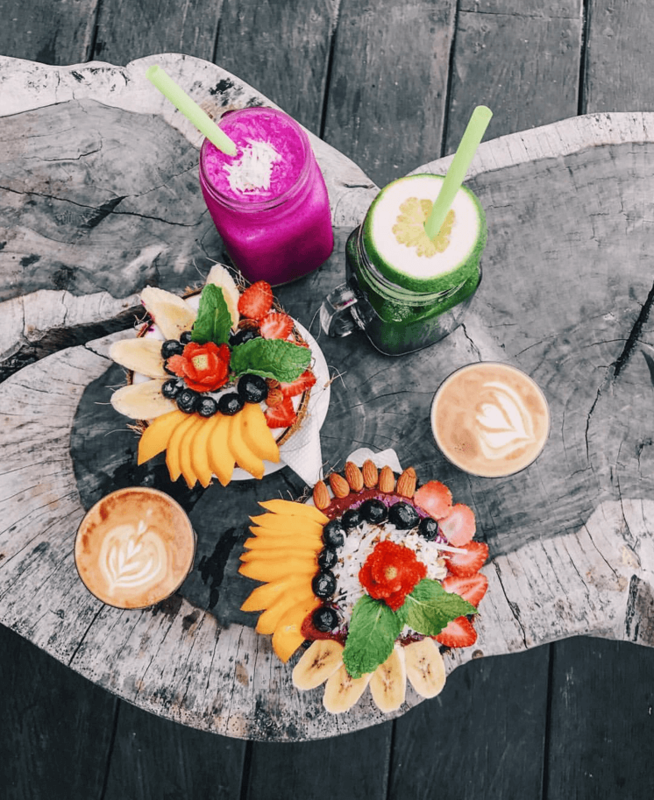 Bali’s most famed smoothie bowl shack has to be on your bucket list when visiting the island paradise, as it’s unmissable from our list of best Bali cafes. 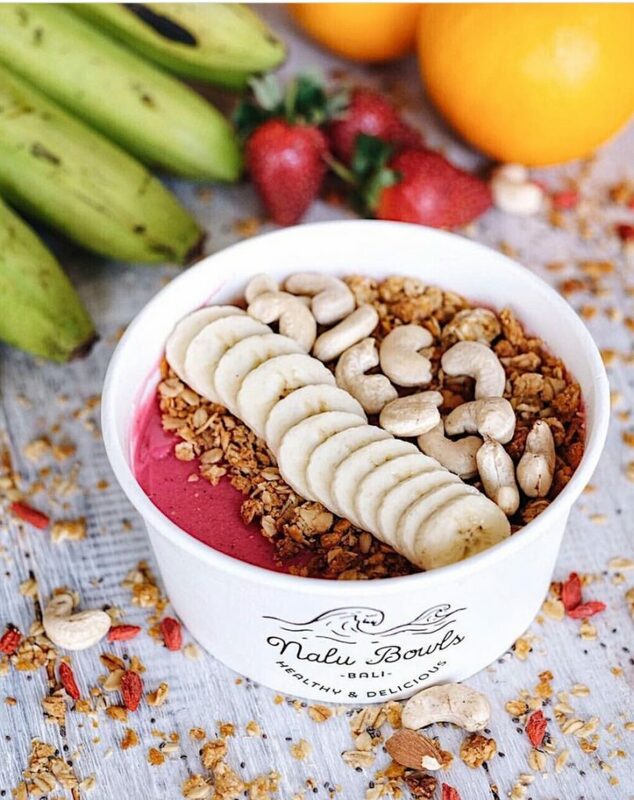 Nalu (Hawaiian for ‘wave’) Bowls was one of the first cafés in Bali to serve smoothie bowls and has gathered a loyal following ever since. Select a bowl from their set menu and customise it with your blend of choice (for example coconut water or soy milk). Add additional toppings and swap ingredients to create your own bowl of happiness. With utterly photogenic outlets in Bali’s hotspots of Seminyak, Canggu and Uluwatu you’re spoilt for choice with their range of locations! Click here to view Nalu Bowl’s whole menu. TAC Tip: Buy a bowl and receive a second bowl complimentary at Nalu Bowls with your copy of Hungry In Bali – Edition 2. The new plant-based café on the block has taken Bali’s café scene by storm. Combine uber-Instagramable interior with delicious, plant-based cuisine, Kynd Community has quickly become the new morning-coffee favourite, daily healthy lunch stop and afternoon-treat hangout (think a mouthwatering Oreo milkshake with coconut ice cream!) for locals and holidayers alike. Whether you’re following a plant-based diet or not, Kynd Community has to be on your Bali bucket list! Click here to browse Kynd Community Bali’s whole menu. TAC Tip: Enjoy 30% off the bill at Kynd Community with your copy of Hungry in Bali. Shop, wine and dine all within the same building – don’t blame us if you go on a spending spree after a few cocktails! Click here to browse the whole menu of Neon Palms in Seminyak. TAC Tip: Enjoy 20% off the bill or unlimited 2-for-1 cocktails at Neon Palms with your copy of Hungry in Bali. Hop on your scooter and treat yourself to a meal at Elgin Avenue Café, off the beaten track yet only a short drive from Lio Square. 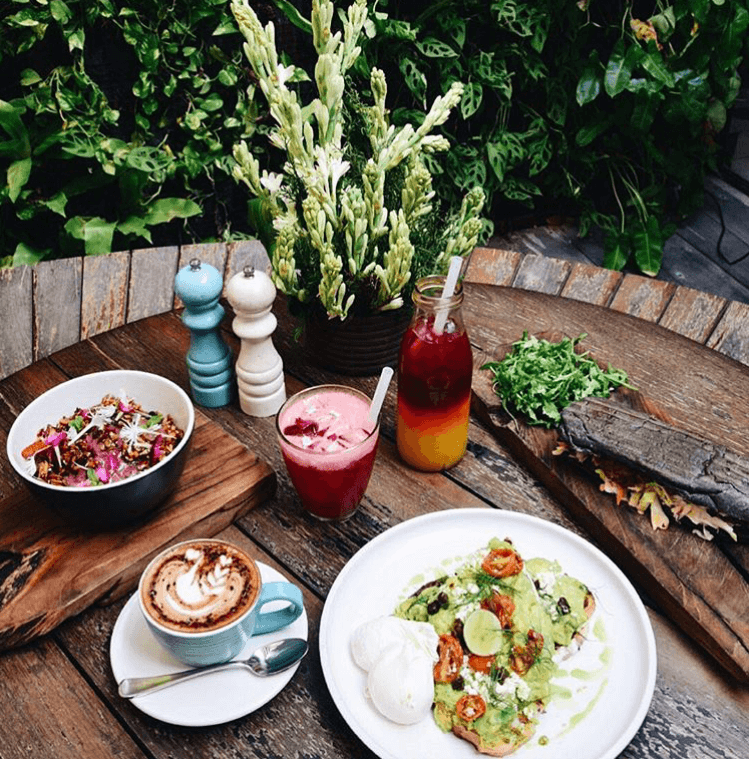 The lovely Indonesian owners used to live in Melbourne and offer not only the finest coffee but also a well-designed menu with all your brunch favourites and beyond from the most high-quality ingredients, in a stylish photogenic setting. Be warned – their signature Crispy Eggs Benedict is highly addictive and might spoil you for the rest of your breakfast life! And for the ones with a sweet tooth: the French Toast at Elgin Avenue is to-die-for! One of the best Bali cafes just off Seminyak’s most popular shopping street, Jalan Oberoi, Revolver Espresso is the perfect break from Bali’s hustle and bustle. Sip the café’s own signature Revolver coffee while soaking in the hipster atmosphere while being spoilt for choice with their large, tasty menu. Don’t forget to look out the back where you can find their Instagram-able pink lounge! Visit their second outlet Baby Revolver for a quick coffee & breakfast fix while shopping along Jalan Petitenget! Click here to browse the whole menu of Revolver Espresso on Oberoi & Baby Revolver on Petitenget. Melbourne goes to Bali! And brings along the most mouthwatering dishes. 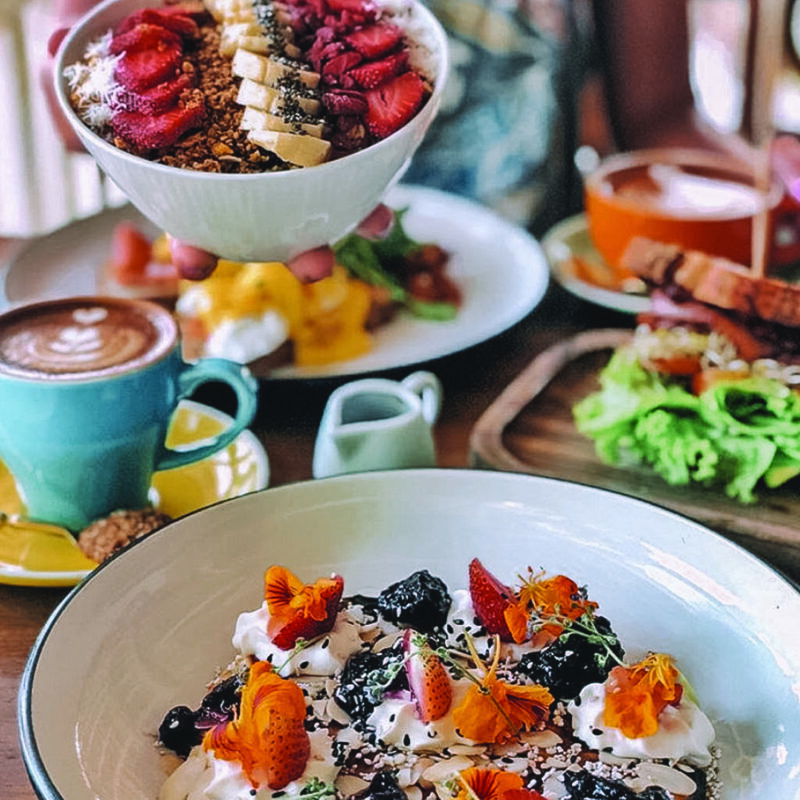 One of the best brunch places in Bali for locals, expats and tourists alike, Sisterfields never fails on delivering the goods. Ever heard of Polenta Fries? Combined with their creamy aioli-truffle dip and cheese, it’s the best splurge since the invention of chocolate! And for the coffee-holics, squeeze in a visit next-door at Expat Roasters for Sisterfield’s little brother coffee heaven! Click here to browse the whole menu of Sisterfields in Seminyak. 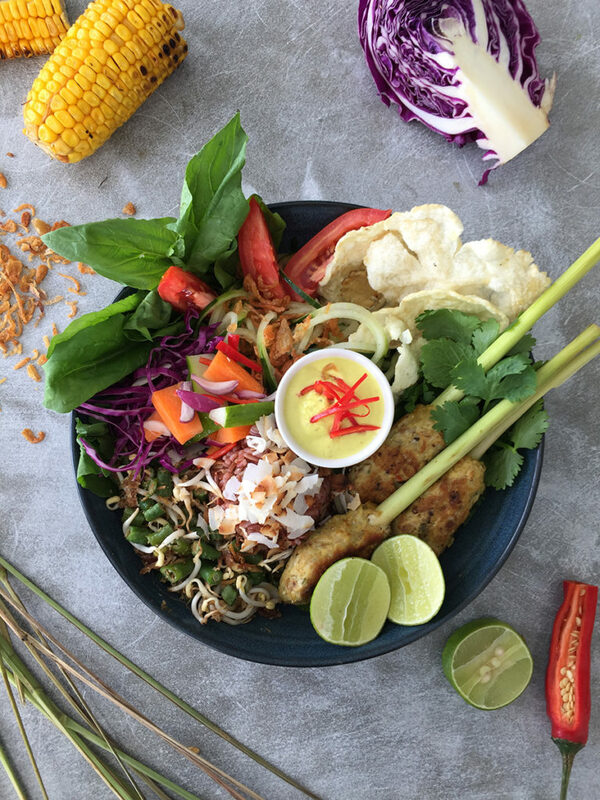 Specialising in healthy eats, Bali Bowls & Smoothies is the new kid on the block that sure won’t disappoint your taste buds. 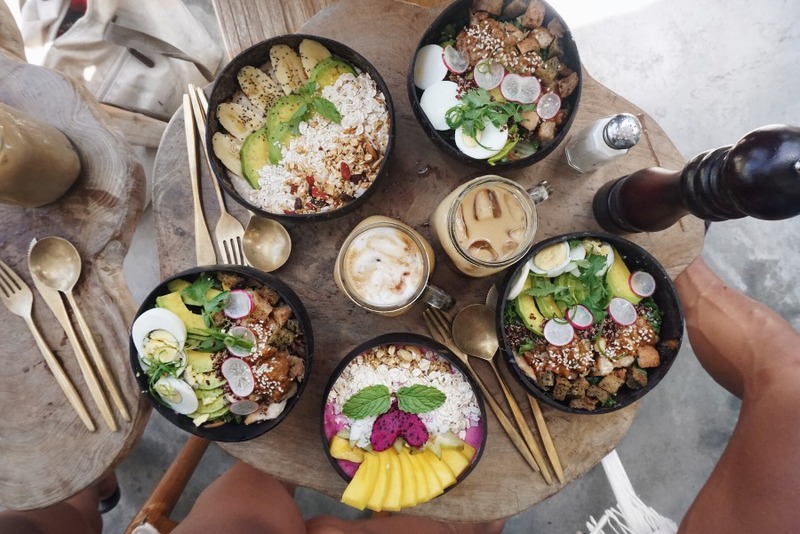 Using fresh and locally sourced produce, Bali Bowls aim to nourish your body and soul while spreading positive vibes around the world (check out their locations in Dubai and Ibiza!). 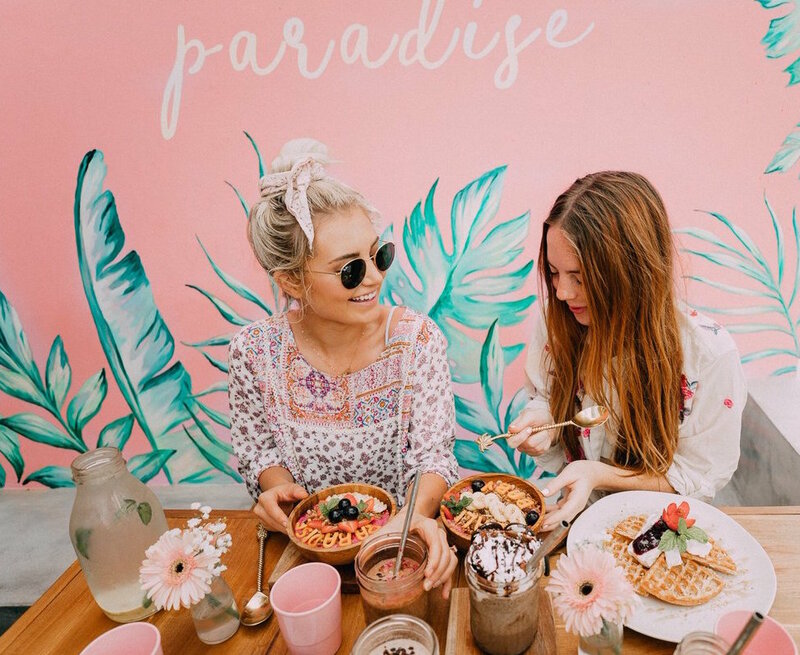 Some of our favourites include the Unicorn Toast, Eat Pray Love Smoothie Bowl and Berry Snappy Poke Bowl. With a range of fresh smoothie bowls, to hearty curries and healthy grills all set in an airy outdoor space plus cozy beachy interior, Bali Bowls will be your new Canguu hangout spot and Insta-worthy gem! 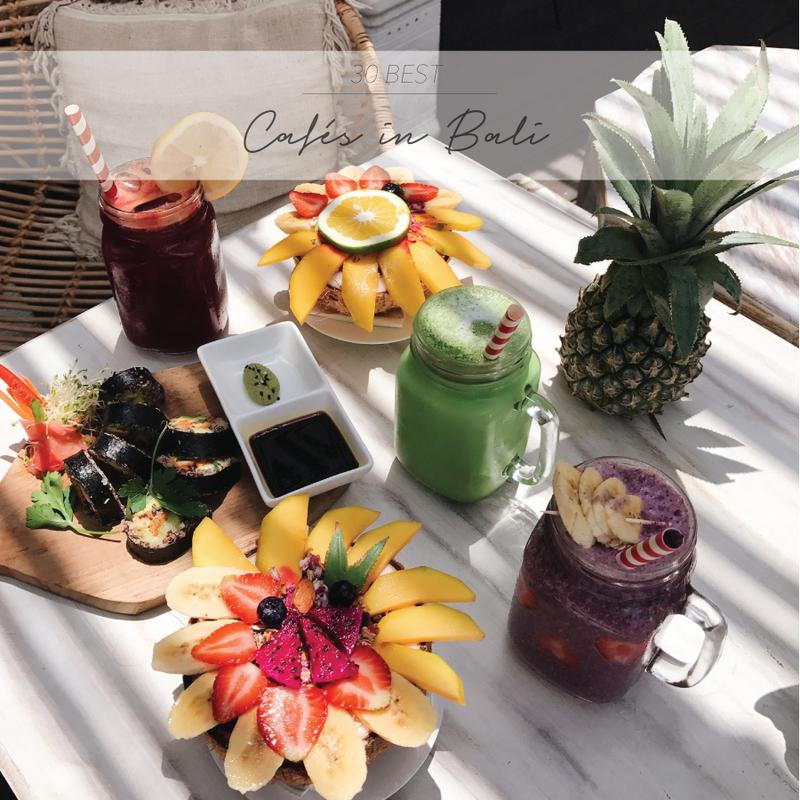 Click here to browse the whole menu of Bali Bowls & Smoothies in Canggu. One of Bali’s most iconic eateries, Café Organic offers health-conscious vegetarian and vegan meals passionately crafted using fresh, locally farmed produce. Wood grains and distressed whites dominate the space inviting a minimalist Scandinavian feel. Every corner has already been snapped for the gram with the star of the show being the Acai bowls served in coconuts! 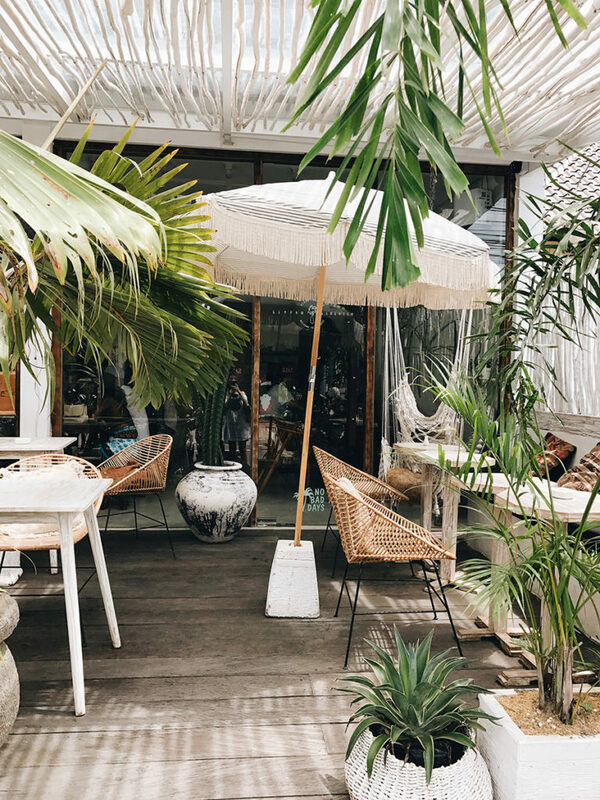 The Canggu spot fuses Tulum vibes meets Mykonos with rustic woods, palm shadows and an open patio filled with cactuses that immediately sets you into island mode. You can also get your daily smoothie bowl fix in their equally photogenic outlets in Seminyak and Umalas! This open loft-style eatery is making a name for itself in Canggu, quickly becoming one of the most-loved go-to’s for vegans, vegetarians, and carnivores! 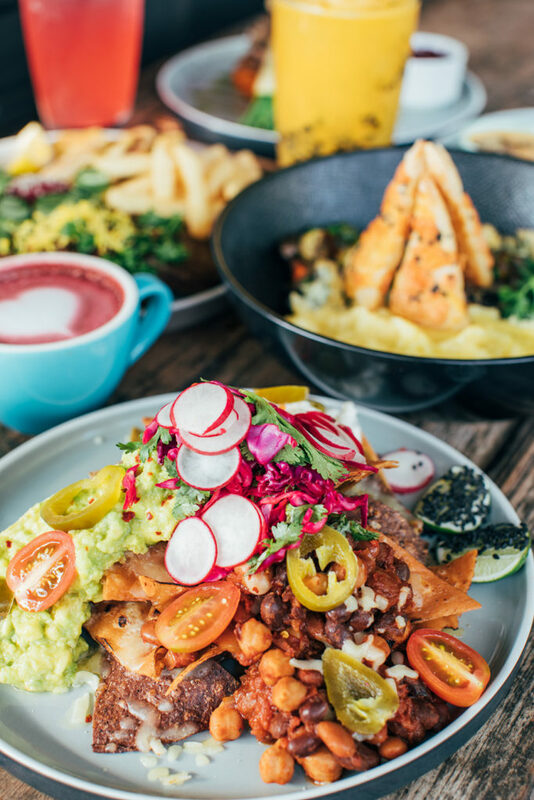 The sister establishment to uber cool Vida Surf Shop Cafe in Bondi Beach invites guests to devour their tailored menu which covers everything from Australian beef burgers and vegan meatball risotto to the smoothie, poke and raw salad bowls. Click here to browse the whole menu of The Loft in Canggu. 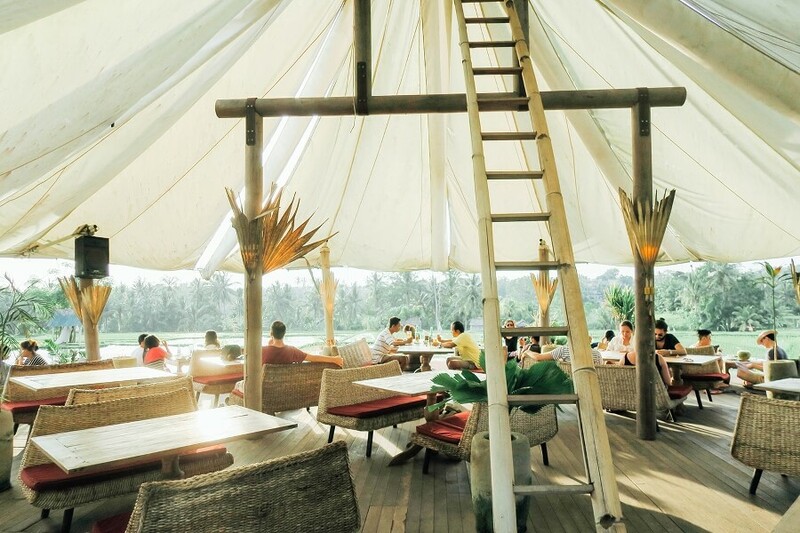 TAC Tip: Receive 25% off the bill at The Loft Canggu with your copy of Hungry In Bali. 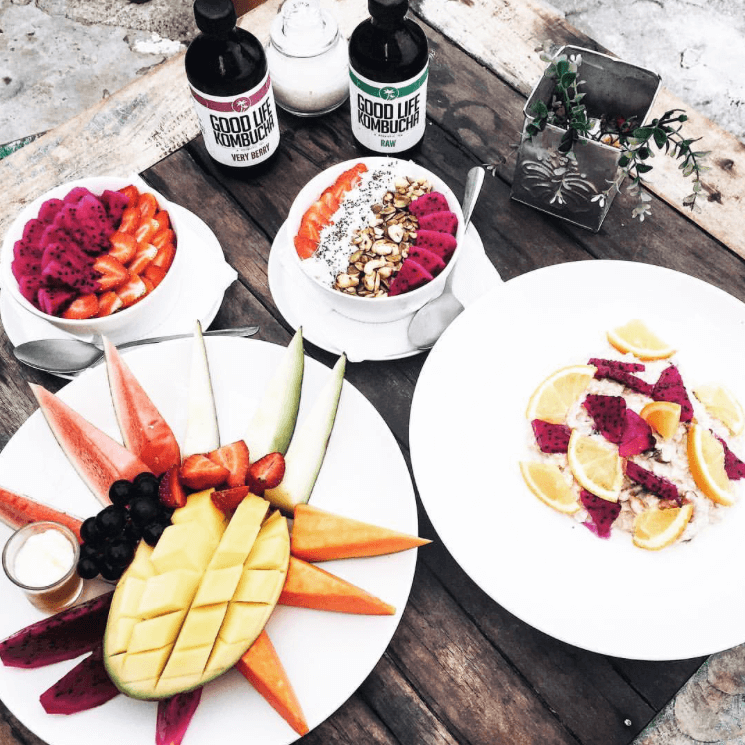 Milk & Madu is located in the hipster area of Canggu in a brand new style for 2018, where surfers, stylish families and travel babes hang out between surf time and sun. How about the Super Brekky Bowl for breakfast, Mexican Salad for lunch and a lava stone pizza for dinner? 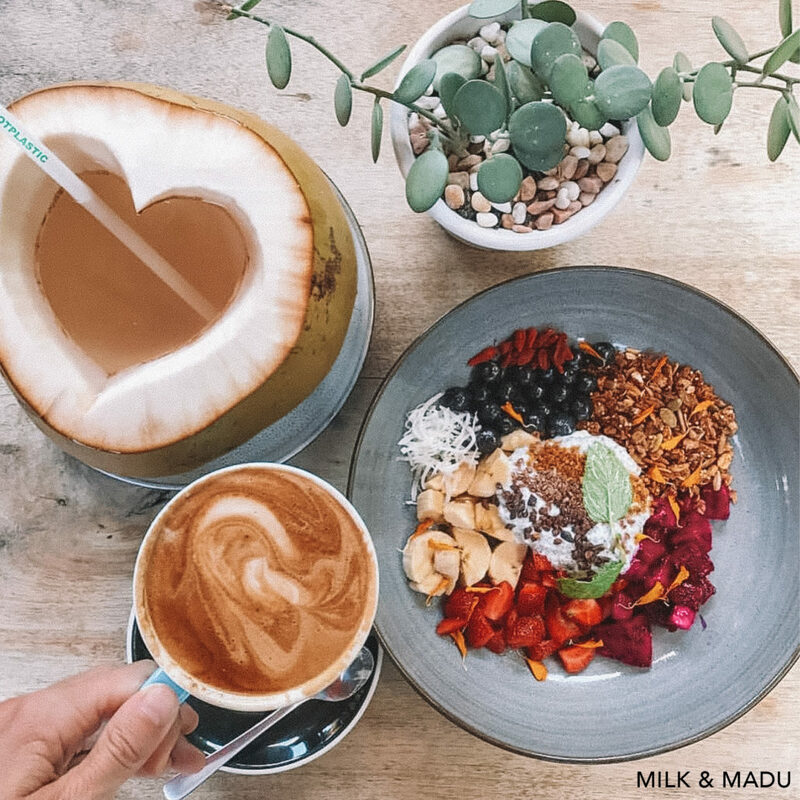 Click here to browse the whole menu of Milk and Madu in Canggu. TAC Tip: Buy 2 dishes to receive 2 complimentary beverages at Milk and Madu with your copy of Hungry in Bali. One of the first Bali cafés along one of Canggu’s main streets Batu Bolong, Betelnut has not lost its spark and is still one of the best cafés in Canggu! 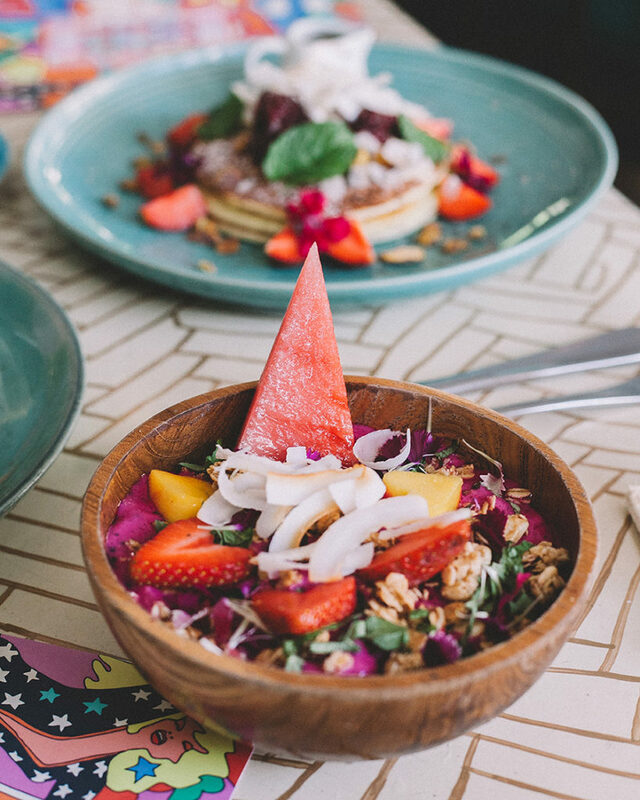 The treehouse-style café made from coconut wood offers a healthy, nutritious and delicious Western menu with a Balinese influence as well as a great view over Canggu’s hustle and bustle. Whether you’re in the mood for tasty Mexican, traditional Indonesian or burgers & fries – Betelnut will have you covered! Click here to browse the menu of Betelnut Café in Canggu. TAC Tip: Purchase 2 main dishes to receive 2 beverages complimentary at Betelnut Canggu with your copy of Hungry in Bali. One of the best cafés in Bali, Watercress has been serving wholesome delicious variants from breakfast to dinner made with love for quite some time now! Whether you join them for their heart-shaped coconut (don’t forget to take the iconic shot!) 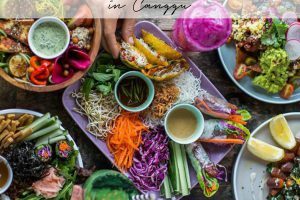 pre-surf, or one of their tasty, fresh salads after shopping along Jalan Batu Belig – this top Canggu café has to be on your to-do list in Bali! Staying in Ubud? You don’t have to miss out on Watercress goodness! Visit their Ubud Watercress outlet on famed Jalan Monkey Forest. Click here to browse the whole menu of Watercress Canggu and Watercress Ubud. TAC Tip: Buy 2 main dishes and receive 2 complimentary beverages at Watercress Canggu with your copy of Hungry In Bali. Don’t get deterred by its name – you have come to one of the best cafés in Bali! First things first: our menu favourites, their bowls. Whether you’re in need of some protein (Protein Bowl), have a craving for cheese after travelling Asia for too long (Haloumi Bowl) or a touch of Japanese (Nori Bowl), the choice is endless! Start the morning with a delicious coconut or kick back after a long, hot day at this vegetarian-vegan shady oasis in the heart of Canggu. 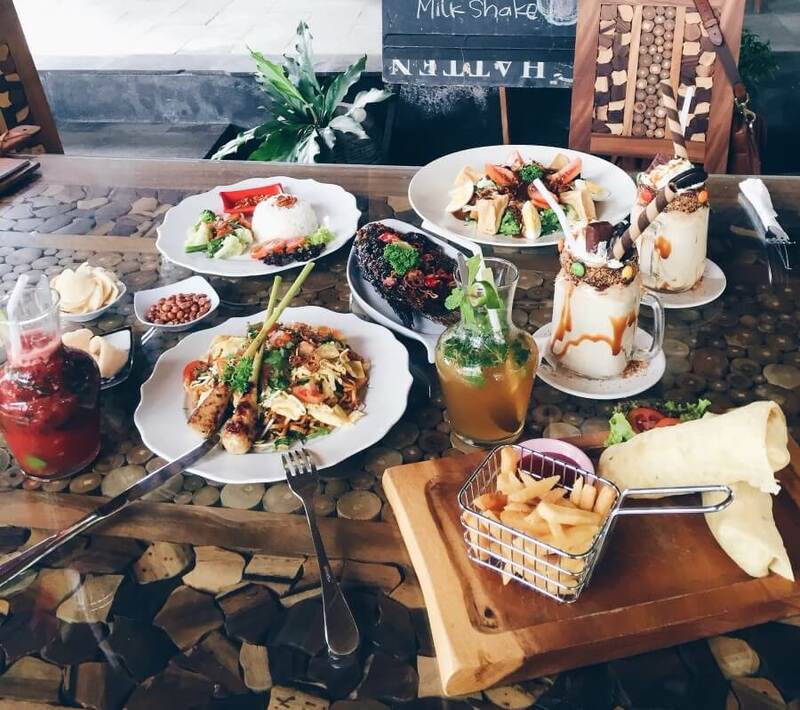 Click here to browse the menu of The Shady Shack in Canggu. TAC TIP: Purchase 2 main dishes to receive 2 beverages complimentary at The Shady Shack Canggu with your copy of Hungry in Bali. Fancy a Smoothie Bowl or one of the best burgers in Bali made from quality Australian imported ingredients for brunch? At Strawberry Fields, you can have both. 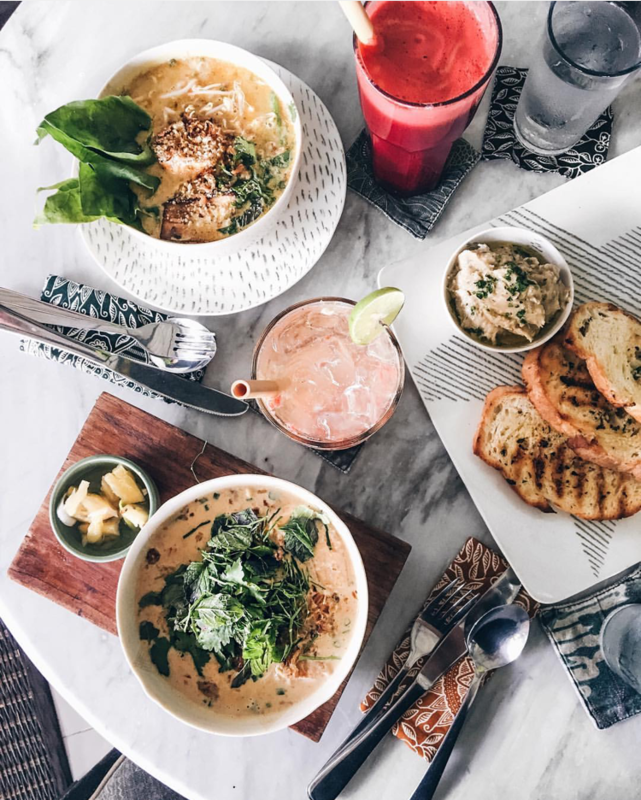 Designed to have both healthy and a few #cheatmeal options, this Bali café gem on Jalan Batu Belig makes it hard for you to choose from their delicious menu. The best way out of this dilemma: pair one of their delicious smoothies with a mouthwatering burger. 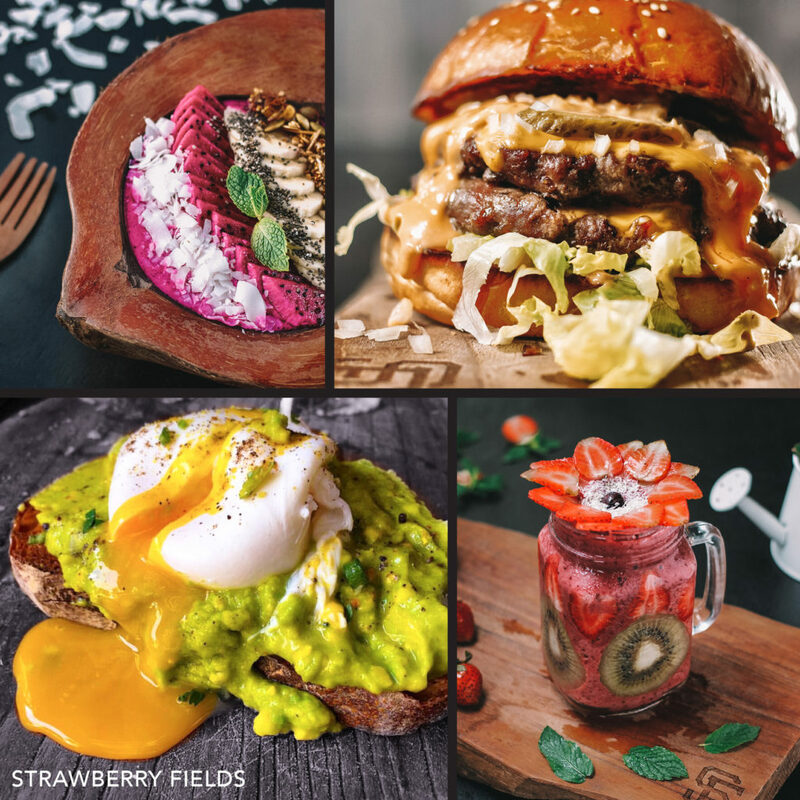 Click here to see the entire Strawberry Fields Canggu menu. TAC Tip: Enjoy 2-for-1 mains at Strawberry Fields with the island’s must-visit dining guide Hungry in Bali. The new Canggu hotspot also boasts a boutique deli filled with freshly baked pastries, and a tonic bar featuring adaptogenic lattes. Click here to browse the whole menu of Parachute in Canggu. TAC TIP: Receive 2-for-1 main dishes at Parachute Canggu with your copy of Hungry In Bali. One of Canggu’s most tantalising restaurants invites you to sit back, grab one of their signature cocktails (our favourite: Tipsy Coco, vodka with coconut water, lime juice and sugar) and soak in the relaxed vibes in a super stylish, bohemian setting. Watch renowned Canadian chef Robin Filteau-Boucher and his skilful local team prepare fresh and local produce, turning it into a culinary experience you will cherish as one of your favourite Bali memories. The good thing, they serve breakfast, lunch and dinner – so you will want to come back more than once! Click here to view the entire menu at Gypsy Canggu. Feel the experience of Libur Musim Panas (Bahasa for ‘summer holiday’) in a traditional beach house and swimming pool with a touch of late 50’s & 60’s Indonesian architecture only a stone’s throw away from Berawa Beach. Have fun in the sun and spend the day by the photogenic pool, listening to old school sounds while indulging in Southern comfort and sipping on their refreshing signature cocktails such as Touch & Go – vodka, kiwi and lime. Click here to view the Panama menu. Located only a few minutes walk from Berawa Beach, this top Canggu café recently upped their menu and they couldn’t have done a better job! Whether you’d like to splurge on a burger – choose between Donald Trump or Barack Obama burgers – or need to fill up your greens with their Green Bowl, all dishes are made with high-quality ingredients and a taste that will have you coming back for more, and yes, this could mean daily. Click here to browse the menu of Ruko Café in Canggu. One of the first and best cafés on Canggu’s ever-evolving Batu Bolong street, Crate Café is a must-visit when living it up in this area with the hip crowd. 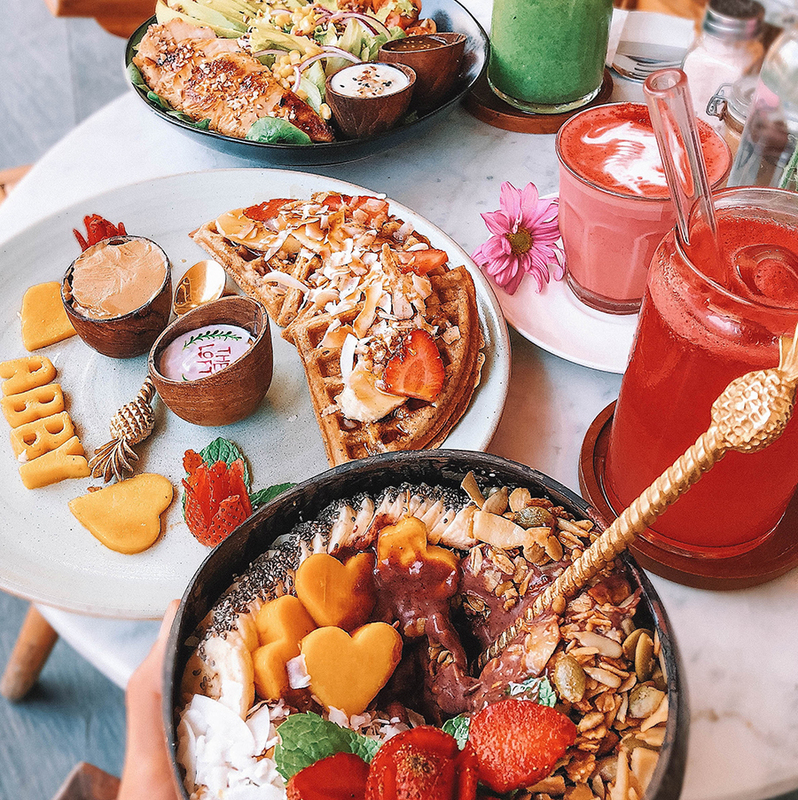 Beat the jet lag thanks to their early opening hours with a coffee from their own blend and a smoothie bowl covered in delicious dragon fruit and strawberries as mouthwatering toppings! The rustic-comfy setting of Crate Café with its buzzing, lively vibe will have you coming back for more! Click here to browse the menu of Crate Café in Canggu. 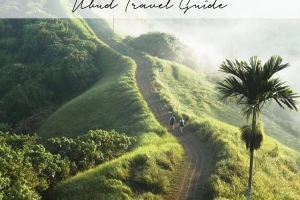 TRAVELLING TO BALI SOON? SHOP OUR ULTIMATE BALI DINING GUIDE & SAVE UP TO US$1,000 AT 60 OF BALI’S BEST VENUES! Retreat to Folk Pool and Gardens to take a break from the hustle and bustle of busy Jalan Monkey Forest. Ubud’s first swim up pool bar and twilight pool cinema are located right in the heart of town with private daybeds, teepees and decks lining the pool. From vegetarian to grill options, the talented chefs also bake their sourdough bread in-house, best combined with one of their delicious fresh smoothies. Click here to browse the whole menu of Folk Kitchen & Espresso in Ubud. TAC Tip: Shop your copy of Hungry in Bali to enjoy 2-for-1 main dishes at Folk Café Ubud. Finally, one of Canggu’s most favourite cafés has opened its doors in the heart of Ubud. All late risers and brunch lovers get to indulge in the famed Milk & Madu menu all day! 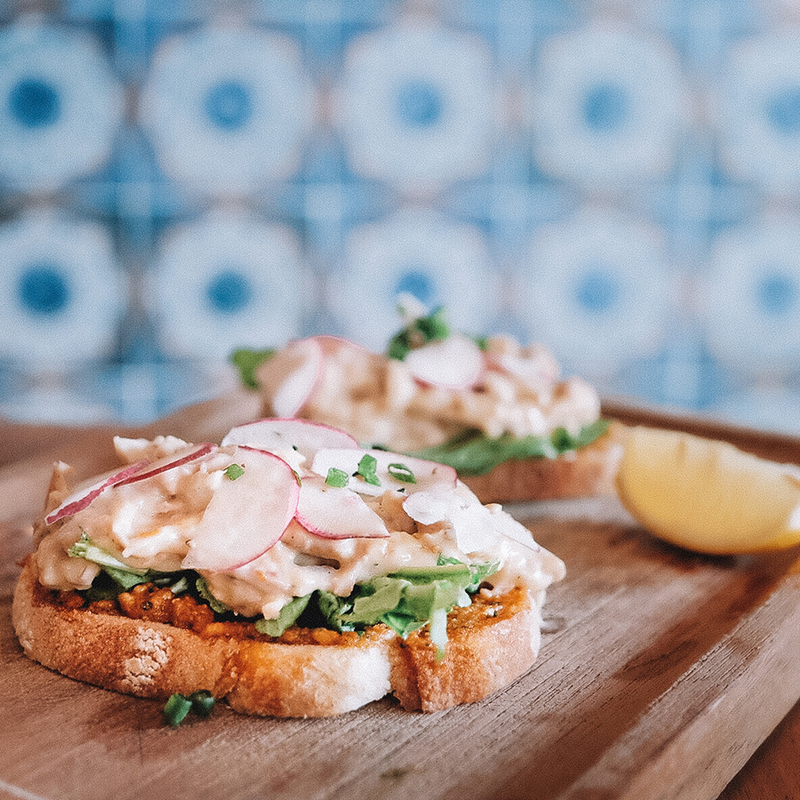 From coffee brewed from their own beans, freshly made croissants and Huevos Rancheros to Brioche Burgers with Aussie beef and Poké bowls with fresh line-caught tuna, Milk & Madu continues to bring inspiring dishes daily. Click here to view the entire Milk & Madu Menu. TAC Tip: Buy 2 dishes to receive 2 complimentary beverages at Milk and Madu using your copy of Hungry in Bali. Watercress serves wholesome tasty variants from all-day breakfast and their famous lunch showcase to savoury dinners made with love and only the freshest ingredients. Whether you join them for their heart-shaped coconut (don’t forget to take the iconic shot!) 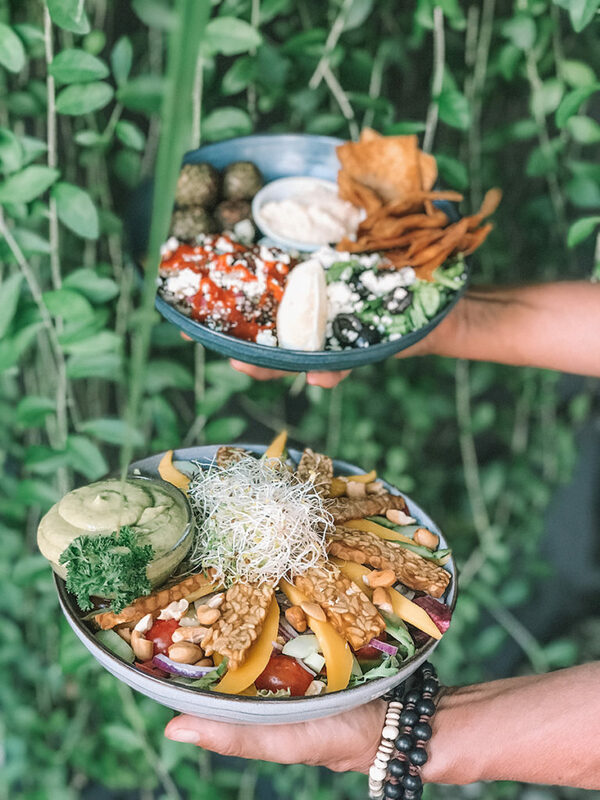 or one of their tasty, fresh salads after exploring Jalan Monkey Forest – this renowned Bali café has to be on your must-visit list! Click here to browse the whole menu of Watercress Ubud. TAC Tip: Buy 2 main dishes and receive 2 complimentary beverages at Watercress Ubud with your copy of Hungry In Bali. Quality ingredients and presentation are key factors in Kopi Kat’s service. Be prepared to be spoilt for choice with dishes influenced by global cuisines. Must-try: their classic Chicken Wrap with a taste of Indonesian flavours. Their traditional Indonesian interior creates a calm and relaxing atmosphere, making it the perfect place to relax and indulge in great food after a yoga class in Ubud. 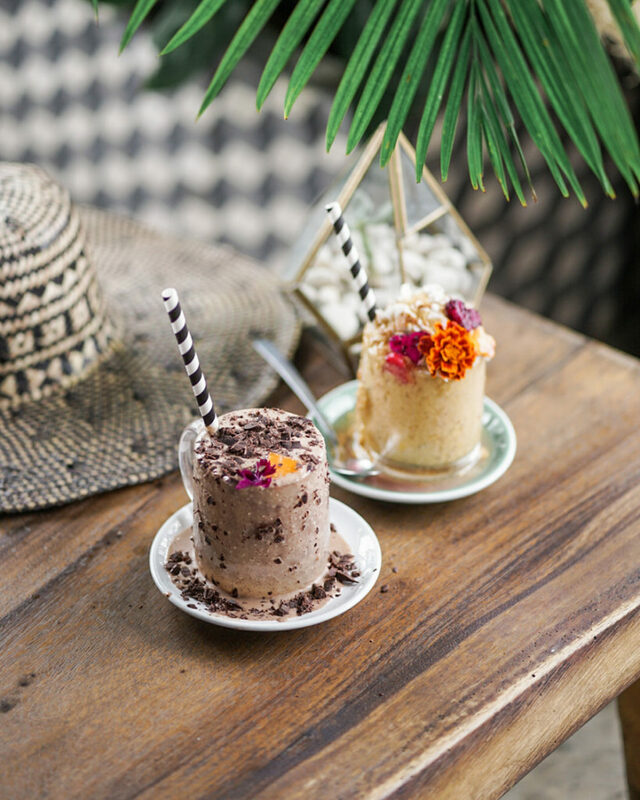 And if you want to treat yourself, you should not miss their Caramel & Peanut butter milkshake – the perfect way to spend a perfect afternoon at one of Ubud’s best cafés! Click here to browse the whole menu of Kopi Kats in Ubud. Café Pomegranate is one of the most Instagram-able and best cafés in Ubud, located in the middle of the rice fields and is only a short walk from the local Ubud market. Founded in 2012 by Japanese brothers, it has quickly evolved into a must-visit Bali café in the jungle town. 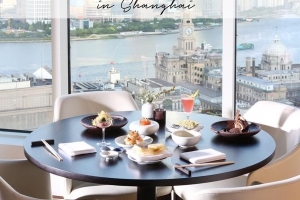 The couple consists of an interior designer and a chef resulting in the perfect match offering food from all over the world, including Japan, Europe and Singapore. The building stands in a unique condition due to the raised altitude compared to the central Ubud area and is disconnected from the busy main streets, providing a stunning 360° open view over the rice paddies. On clear days you can catch sight of the holy Agung mountain as well as a breathtaking sunset. Click here to browse the whole menu of Café Pomegranate in Ubud. 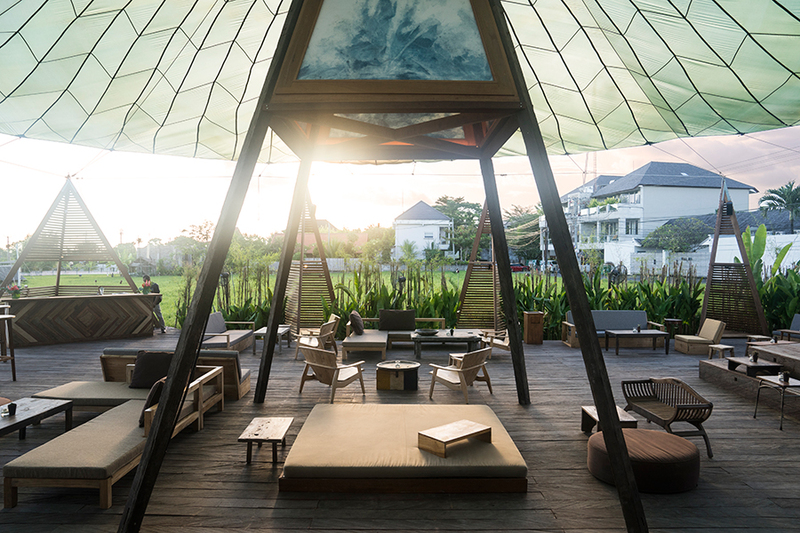 Overlooking the beautiful Tjampuhan Ridge in the cultural heart of Bali, The Elephant opened up in 2013 with the hope of creating delicious, healthy food in a conscious and sustainable manner. Besides being recognised for their environmental awareness and socially fair work practices, they also thrive to follow the slow food movement offering solely vegetarian cuisine. Offering a relaxed but stylish atmosphere – not to mention the great views – The Elephant is one of the best cafés in Ubud to nourish your body and soul. Click here to browse the whole menu of The Elephant in Ubud. 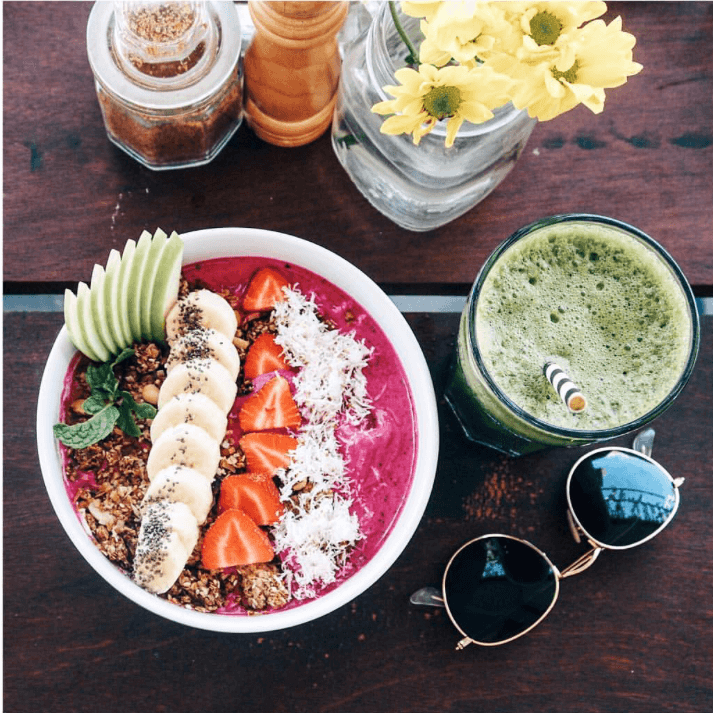 If you haven’t come across this famed Bali Smoothie Bowl shack on Instagram yet, you are either not signed up or have clearly missed something! 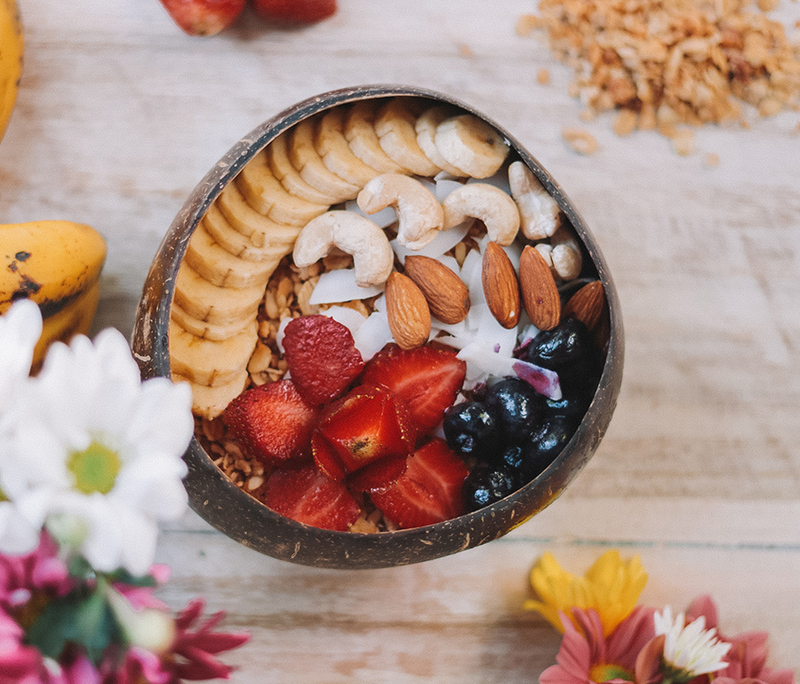 Nalu (Hawaiian for wave) Bowls was one of the first cafés in Bali to serve smoothie bowls – and we have to admit, they taste like pure fruit-happiness and are one of the best smoothie bowls in Bali! 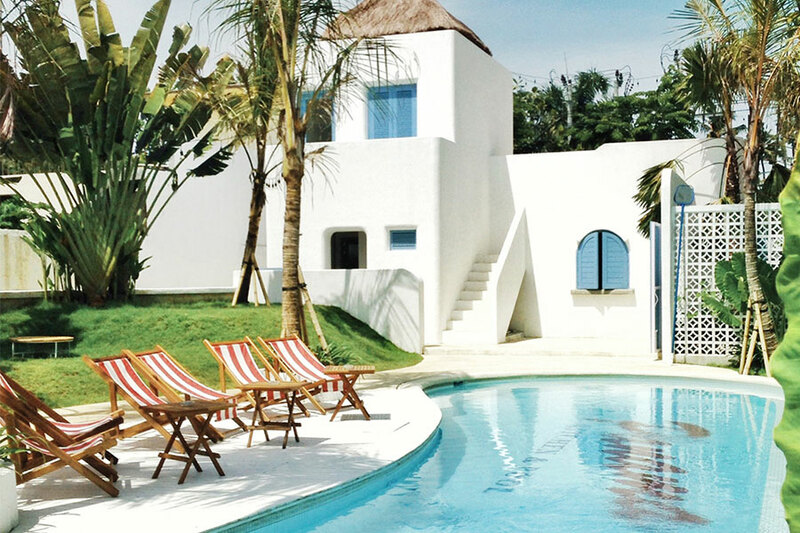 With outlets in Bali’s hotspots Seminyak, Canggu, Uluwatu and Ubud you surely won’t have to miss out on them! Click here to browse the whole menu of Nalu Bowls. TAC Tip: Get your copy of Hungry In Bali and receive 2-for-1 Nalu Bowls & many more discounts at Bali’s Most Instagramable cafes. A must-visit when venturing around the beautiful Bingin area on Bali’s Bukit peninsula is one of the best cafés on the Bukit, The Cashew Tree. Serving healthy fresh food along with mouthwatering smoothie and juices, it will quickly evolve into your all-time favourite! Once you have tried their Chicken Teriyaki bowl, Bento boxes and Açai bowls, you will come back for more – trust us! Click here to browse the whole menu of The Cashew Tree on Bali’s Bukit Peninsula. TAC Tip: Receive 25% off the bill at The Cashew Tree with your copy of Hungry In Bali. 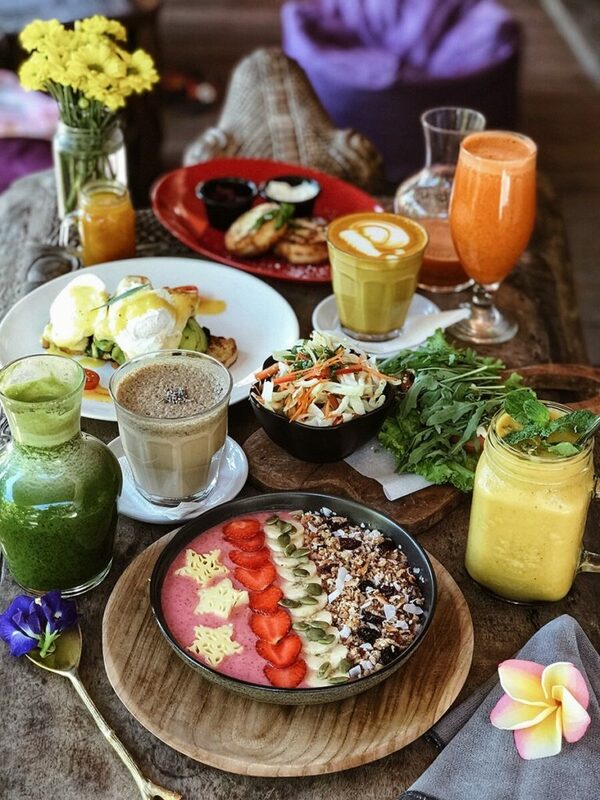 A must-stop while venturing around Balangan area is one of Bali’s yummiest vegetarian & vegan-friendly cafes, The Smoothie Shop Juice & Breakfast Bar. By creating a menu that focuses on using mostly the freshest organic products from local farmers, the team at Smoothie Shop are whipping up tasty dishes, raw treats, and thirst quenching juices and smoothies that are sure to leave you feeling good on the inside and glowing on the outside. Whether you want to fuel up after a big surf with their Chocolate Ironman shake and Shakshuka or treat yourself and your body to a raw vegan pizza, the menu including the amazing mild roasted Arabica coffee bean selection will leave you spoilt for choice! Single Fin is the ultimate must visit venue in Uluwatu with its large balcony overlooking the dramatic cliffside, boasting stunning views of the spiritual home of surfing. Days at this laid-back surfer’s favourite are accompanied by the tastiest of fusion cocktails while watching the surfers ride the waves of Bali’s famed surf break. Enjoy their delicious sharing plates with your friends from one of the island’s best sunset locations to the tunes of renowned resident DJs. Join the hip crowds for one of the island’s most hyped Sunday sessions for a dance under the stars. TAC Tip: Enjoy 2-for-1 mains at Single Fin – one of Bali’s Best Sunset Bars using your copy of Hungry in Bali. 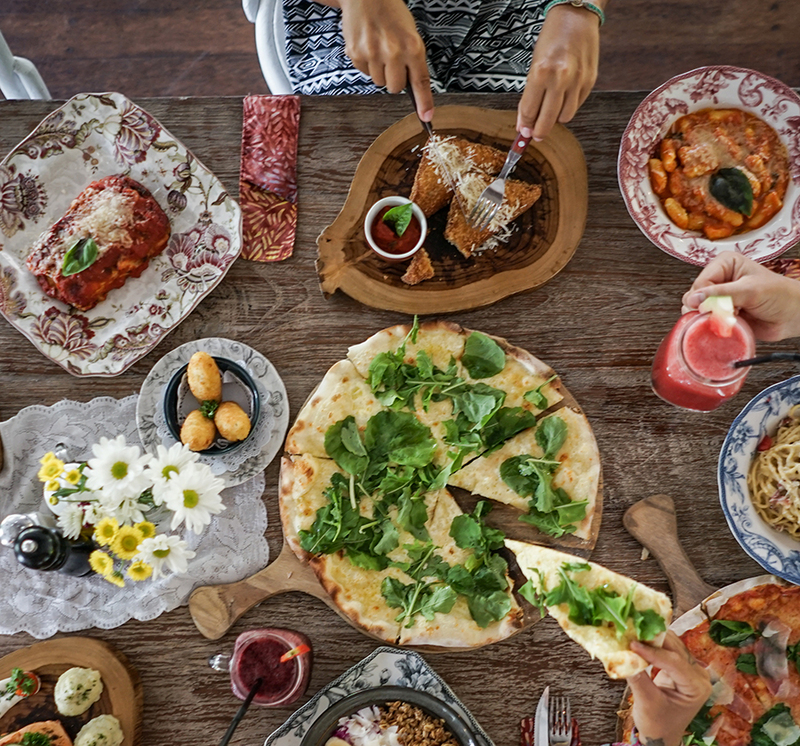 Located on Uluwatu’s eat street Jalan Labuansait, Rolling Fork offers some of the best homemade Italian food you’ll enjoy on the island. From ravioli filled with ricotta and spinach to delicious gnocchi with sauces of your choice – Rolling Fork specialises in homemade pasta and your taste buds can tell. Also, pizza lovers won’t be left out with a mouthwatering selection of wood-oven goodness! TAC Tip: Buy a main dish to receive a second main complimentary at Rolling Fork with your copy of Hungry In Bali. 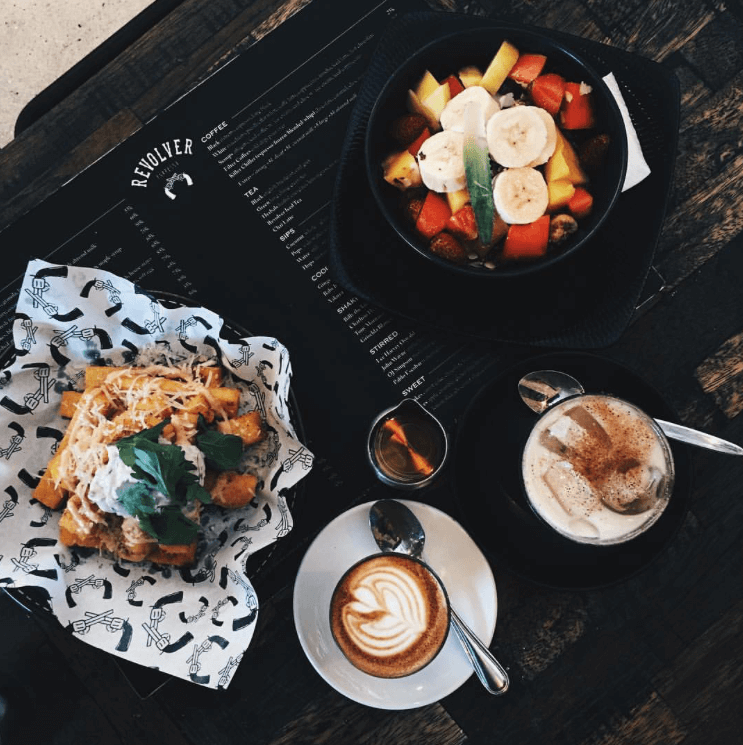 Situated in between the two stunning Bali beaches, Bingin and Padang Padang on Jalan Labuan Sait, Bukit Café is a fresh and innovative eatery. 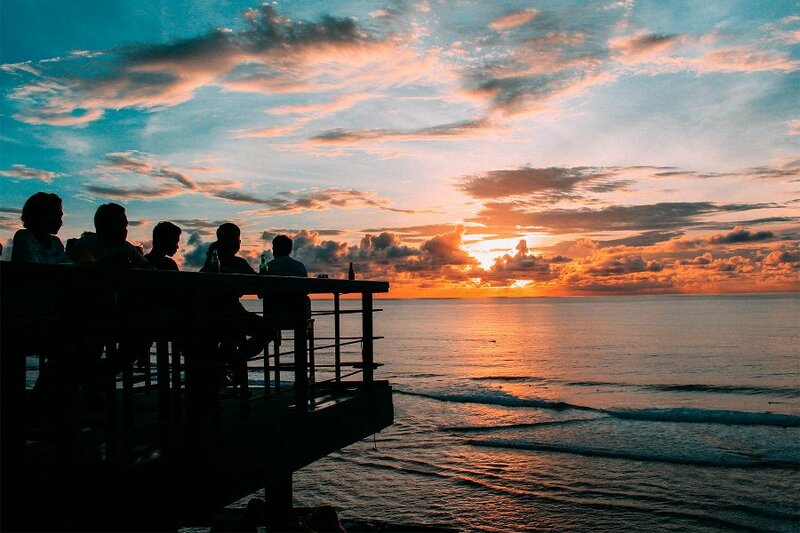 Whether you are after fuelling your body before/after a surf or simply looking for a delicious dinner with family and friends – Bukit Café’s extensive menu featuring seasonal products and high-quality dishes will make sure you get what you are looking for. Click here to browse the whole menu of Bukit Café on the Bukit. HUNGRY IN BALI – THE ULTIMATE BALI DINING GUIDE WITH UNIQUE PRIVILEGES ACROSS 60 OF BALI’S BEST VENUES! Our guide directs you and your travel partners in crime to Bali’s 60 hottest must-visit venues that cannot be missed across Seminyak, Canggu, Ubud and the Bukit Peninsula. But the best is yet to come – each venue offers a unique privilege when presenting your HUNGRY IN BALI premium print hard copy or e-book before ordering. Receive 2-for-1 main dishes and spa treatments, complimentary cocktails, 30% off the bill, and many more unique privileges across Bali’s best restaurants, hippest cafes, trendiest beach clubs and most relaxing spas. So we not only guide you to the hottest places in Bali – but we also help you to save up US$ 1,000 on your Bali trip! Keep on reading for a sneak peek into HUNGRY IN BALI‘s unique privileges that will await you at the island’s most famed venues. We’d love to hear from you in our The Asia Collective – Luxe Travellers group on Facebook – join to share your travel tips and ask for advice from the like-minded travellers.